KUALA LUMPUR, Malaysia — Torn apart by war, Syria's national soccer team is coming together for a spot at next year's World Cup. 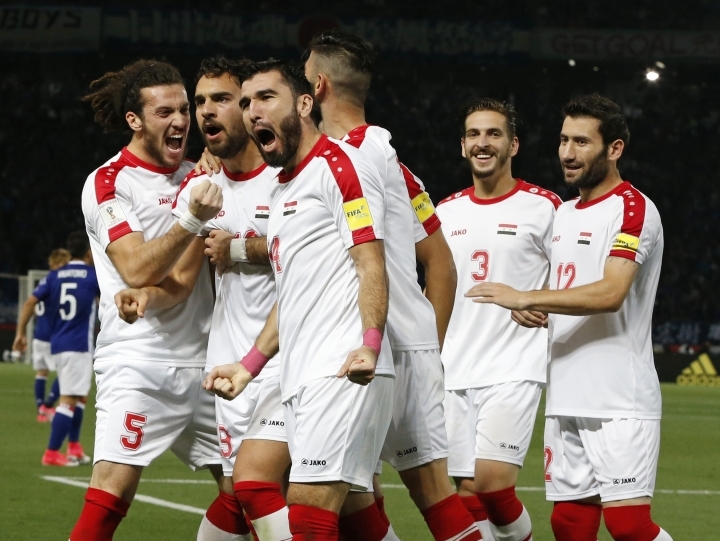 The Syrians have never before qualified for a World Cup, but they will face Australia in a two-leg playoff starting this week. If the Syrians prevail, they will have to win another two-leg playoff against a team from CONCACAF, the confederation that consists of North and Central America and the Caribbean, to qualify for the World Cup in Russia. That team could potentially be the United States. Unable to play on home soil because of the conflict, the Syrians will "host" Australia in Malacca, Malaysia, on Thursday in the first leg of the Asian playoff. The second leg is set for Tuesday in Sydney. Just as the nation has been riven by war and either support or opposition to Syrian President Bashar Assad, the national team has also been split. Some players skipped important qualifiers until recently, but things seem to be getting better. Firas Al Khatib had been absent from the team until earlier this year when he returned along with Omar al-Soma. Neither player has given their reasons as to why their exile ended except to say it's related to sports rather than politics. "The important thing is that the team is determined to try and qualify for the World Cup," Syria striker Omar Khribin told The Associated Press. "We have played against some very strong teams so far such as South Korea, Iran and Uzbekistan. We competed well against them and proved that we are also a strong team." Syria was regarded as a long shot at the start of the third round of qualification, and only two goals from the first seven games seemed to confirm that perception. But after starting out as hard to beat and defensive, the Syrian team became more attacking. The return of al-Soma and Al Khatib made a difference, giving Syria one of the most dangerous forward lines in Asia. Together, they have scored seven goals in the final three games. Two of those goals came in the make-or-break last game against Group A winner Iran in Tehran, where al-Soma scored deep in injury time to secure a 2-2 draw against a lineup that hadn't conceded any goals in the previous nine games in qualification. That result was enough to secure the match against Australia, which finished behind Saudi Arabia on goal difference. Players, with "Syria" rather than names emblazoned across the back of their red jerseys, sank to their knees on the turf in Tehran to celebrate. "We have worked so hard in qualification for the World Cup," Khribin said. "The spirit in the team is very good. We know that we still have work to do, but we are ready for whatever happens." In Syria, thousands of dancing fans filtered onto the streets of Damascus chanting "Syria" and waving the country's flags. 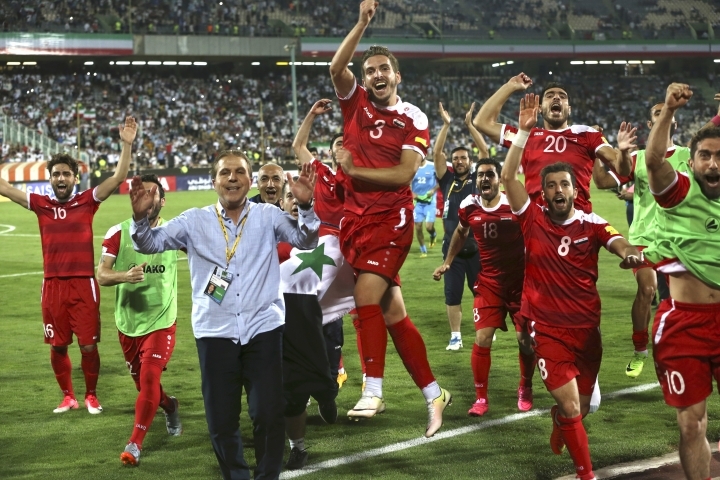 But while Syrians were delighted to reach the playoff stage, Australia wasn't. The Asian Cup champions have qualified for the last three World Cups and coach Ange Postecoglou has come under heavy criticism for not ensuring an automatic spot in Russia despite only one loss in the qualifying campaign. "I have not lost (faith) in what I do," Postecoglou said as he prepared this week to face Syria, which is unbeaten in five "home" games in Malaysia. "We watched all their qualifying games. We know what they bring to it. "It's match play against an opponent over two games knowing that it's do-or-die scenario. They managed to score goals late in games to get themselves results and obviously they are hard to break down." Syria midfielder Mohammed Zaher Midani was quoted as saying on the Asian Football Confederation's website that his team would have the ingredients to beat the higher-profile Socceroos. "Australia may have many prominent players who are known for their individual talents, but we have the enormous potential that comes from performing as a group, as well as the individual skills of our players," Midani said. "And we have a huge motivation — which is to make the Syrian people happy."